Ask a Political Scientist: Cheri G.'s Second Question: Where have all the veteran presidents gone? Cheri G.'s Second Question: Where have all the veteran presidents gone? Please give your analysis of the history of military leaders becoming political leaders. Why do you think our military leaders now refuse the transition? Should they or shouldn't they? She adds, in a comment, "Specifically, the Presidency." Hmm. That is a great question. It is common wisdom that the presidency of the United States was once the domain of military commanders, yet today is largely a landing point for folk who served in primarily civilian government positions prior to taking office. Interesting, eh? Before I go on, I want to lay a few ground definitions. In the "veteran" category I have several possible answers - no, meaning that the president never served in either a militia or a professional military service; yes, meaning the president served as a member of the professional Federal military; and militia, reserve, and national guard, which refer to non-professional citizen soldiers who are simultaneously open to command by either the Federal or State governments on certain occasions. Moving on, a few observations. One, the there are clear periods in which military service seems to be particularly critical in the selection of the president and others in which it is comparatively less important. The most obvious of these is the early 20th Century, from the presidency of Taft till that of Truman, a period that, perhaps ironically, saw the United States truly emerge as a great power on the world scale, become a transcontinental land-forces power during the First World War, survive the Great Depression, and then emerge as one of the two superpowers after the Second World War. There are two other major periods of time when military service when military service is of limited significance, it would seem. First, the early Republic, after the presidency of Washington, saw only one veteran president who actually served in combat, Monroe - only with the triumph of Jacksonian democratic values did military experience become a major theme once more. Here we see Reagan, who was in the military but served in noncombatant roles, Clinton and Obama who did not see military service, and George W. Bush who's service in the Air National Guard is, well, not particularly renowned. Indeed, to put it another way, only Jimmy Carter and George H.W. Bush served in active combat duty of all the presidents of my lifetime and neither of them was a two-term president. 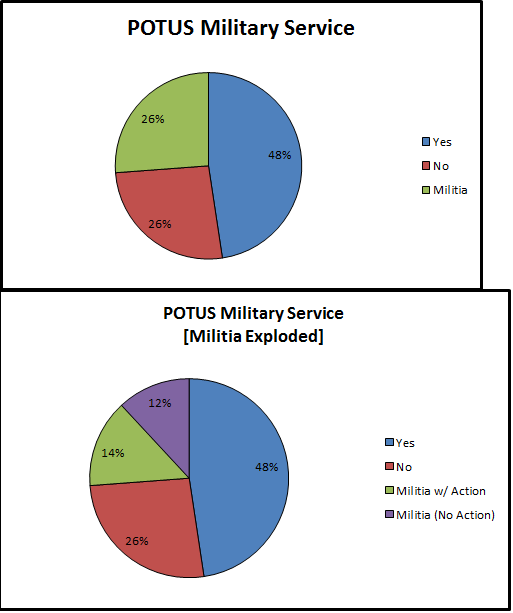 So, our initial statement may be, yes, it seems that, at least for the time being, military service is not a litmus test for the presidency, but this tends to come in patterns historically and there is no reason to expect that it might not once again become a necessary credential for the office. But why is this the case? Well, I have some thoughts. First, we can understand the United States as a Janus figure - we have two minds. On the one hand, we're republican (more focused on elite expertise and trusteeship) and on the other we're democratic (more focused on representativeness and popular will). What it seems like to me is that in periods where the republican impulse is winning we tend to see non-military elites winning the presidency. In the case of the early Republic this meant the philosophers that helped generate the American political system; in the early 20th Century this meant Taft, who was far more significant as a Justice of the Supreme Court, arguably, than as a president; Wilson, the professor; Harding and Hoover, the entrepeneurs; and Coolidge and Franklin D. Roosevelt, lifetime civilian political leaders. Now, I'm hesitant to project this too much on the current day - after all, in the case of the late 20th Century and early 21st Century we see the emergence of men who primarily worked in the private sphere, then moved into state politics, which then led them to the presidency. In periods where the democratic/populist impulse has dominated we've been much more likely, but it is difficult to argue that politics of the post-Cold War period haven't become substantially more populist with time, though populism is increasingly divided between multiple visisons of that word. Secondly, we see other patterns - some generations have vastly more veterans than others as a product of the general historical conditions in which they find themselves - thus it isn't surprising that the periods after the great wars against Native American peoples, the Civil War, and the World Wars should yield many presidents. What is interesting to me, however, given the enormous size and scale of American military exertions of the US military in the Cold War and post-Cold War period is the very small number of "Cold Warriors" that have served as President - only ONE president served in a post-World War II military conflict - Jimmy Carter! Why is this the case? Probably in part it is because Americans have complex feelings about their military. This has been true ever since the Founding Fathers repeatedly expressed their fears of the danger of standing, professional militaries. Americans are incredibly, and properly, proud of their military capabilities, yet they are also keenly aware of the irony of using men and women to force other men and women do things they don't want to do within the context of our own political ideals. Americans are also increasingly uncomfortable with the emergence of our military-industrial complex, as described by President Eisenhower, even if they aren't certain what they should do about it. So the ethical, financial, and practical quagmires of the dirty little wars of the Cold War and post-Cold War period - Korea, Vietnam, the 1st and 2nd Iraqi, and the Afghani to name a few - are problematic as prestige devices, even if they have instilled the same valuable lessons in their survivors as previous conflicts. Additionally, the path to the White House seems to have changed - relationships to party elites at the state and then national level, as well as a TV-friendly demeanor seems to have become more important over time. In other words, if your youth isn't spent working with party machines but serving in the field, and if you aren't pretty and fancy-spoken, you're likely not to even get nominated, much less elected. Eisenhower was gruff. Washington had false teeth. Jackson was, um, Jackson. Lincoln was ugly. Grant liked the booze. McKinley was fat. Tough to imagine any of them in the Oval Office today. Finally, I have to think that there is an increasingly complicated set of feelings among veterans towards service in elected position - a lot of veterans feel like the political system is simply not the place for them, either because they have a strong disdain for civilian politics or because they ideologically don't find a place for themselves in either party comfortable enough for them to decide, well, I think I'll give up my personal life for this. I guess the simplest answer isn't that simple - partly it is our post-Korea/Vietnam/Iraq/Afghanistan ambiguity, partly it is our professionalization of electoral politics, and partly it is our shift to electronic mass media that explain why veterans are less likely these days to be President. As for me, I'm still dreaming of President Colin Powell. But I'm not betting on it.